BMO Capital have updated clients with their latest foreign exchange forecasts as we move through the third quarter of 2016. The post-Brexit landscape has seen some notable revisions made to the foreign exchange forecasts held at the world’s major financial institutions. The latest of the big names to update clients on their forecasts are BMO Capital, the Canadian investment bank. 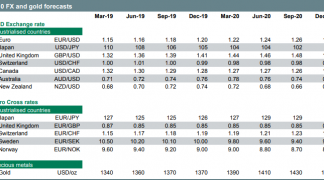 Researchers at the bank reflect that uncertainty isn’t just high for the UK and Eurozone and that in FX, Japan’s Yen seems to have been more displaced by the event than the Euro. BMO acknowledge that the outlooks for EUR and GBP in the wake of Brexit are much more difficult calls. “Brexit has introduced a multitude of complex factors into the mix for EUR & GBP. Versus the USD, we expect a post-Brexit discount to remain embedded in both currencies for 3-6 months, as slower growth, restrained investment from abroad and additional central bank easing weigh,” says Greg Anderson, BMO’s Global Head of FX Strategy in New York. It is noted that Brexit adds a political risk discount to EUR because populist movements will be active across the EU seeking their own referendums as election cycles commence in three big Eurozone countries. “Looking in to 2017, we believe that the strong economic, political and financial linkages between the UK and EU will push both sides towards arrangements which broadly reflect the status quo, and we have built that expectation into the 9-12M portion of our EURUSD and GBPUSD forecast profiles,” says Anderson. With regards to the US Dollar, it is the US Federal Reserve that counts. The key objective becomes preventing contagion rather than slowly evolving policy toward where it should be 1-2 years down the road. This presumption of the policy maker response function is why BMO’s economists changed their Fed call to one hike in December. “This change in the Fed view materially alters our USD view. We now look for a relatively flat USD profile for the remainder of Q3 and through the 08-November US election—albeit with a little Fed-induced surge at the end of the year,” says Anderson.